Boyd Park Plus is a new initiative to revitalize Boyd Park (located on Main Street) into the neighborhood’s crown jewel. Driven by the Eastside Hill Neighborhood Association (EHNA) Steering Committee, this project will create an active community space of which we can all be proud. The vision is to build a neighborhood green space offering neighbors of all ages an attractive area to play, stage events, gather, and celebrate. Many ideas are on the table, and opportunities for community input are on the way, but some of the major legs of the project will include more and better playground equipment, profoundly improved river access, preservation of the park’s ice skating area, a community garden program, and upgrades to the prairie area. Boyd Park Plus is a multi-phase project already underway. The two major phases are 1) development of a conceptual plan, and 2) park reconstruction. Both phases involve many steps and plenty of fundraising. Since the City of Eau Claire cannot begin to consider major improvements to Boyd Park for several years, the Neighborhood Association has decided to push ahead, creating a plan for the park ourselves and raising the needed money through private donations and grants. Now more than ever, it’s important to offer our neighborhood opportunities to stay active, connect with nature, and strengthen our social bonds – and Boyd Park is a great place to do it. This is a major project, but Boyd Park Plus is a grassroots effort. Neighbors can step up to the help the effort through donations and volunteer time. Right now, our major need is money for a professional conceptual plan, which will be created by veteran Eau Claire design firm Ayres Associates at a discounted rate. Even so, it’s an expensive part of the process. Our initial financial goal is $10,000. The EHNA Steering Committee is a registered 501(c)(3) and donations to Boyd Park Plus will be tax-deductible! Why Boyd Park? Why Now? The Eastside Hill Neighborhood Association (EHNA) Steering Committee is committed to Boyd Park Plus as our next large-scale development project. Amid other priorities, in a neighborhood-wide survey conducted in 2018, Eastside Hill residents identified improvements to Boyd Park (located on Main Street, between McGraw and Summer Streets) as their number one concern. Since the City of Eau Claire cannot begin to consider major improvements to Boyd Park for several years, the Neighborhood Association has decided to push ahead, creating a plan for the park ourselves and raising the needed money through private donations and grants. To accomplish this revitalization, the Steering Committee created the Boyd Park Plus initiative. In the fall of 2018, we entered into a Memorandum of Understanding with Eau Claire’s Community Services Department allowing us to plan and recommend specific improvements to Boyd Park which the city would then review. The Eastside Hill Neighborhood Association Steering Committee was formed in 1997 to stage neighborhood events, foster community projects, and advocate on local issues. The Steering Committee meets at least once a month to plan and strategize. Historically, the EHNA has played a vital role in developing and advocating for Boyd Park amenities, including the pavilion and shelter/warming house, the prairie area, and the footbridge connecting the neighborhood with the city’s bike trail on the other side of the Eau Claire River. None of these things would exist as they do today without the involvement of passionate Eastside Hill neighbors and the EHNA Steering Committee. Who Decides on the Changes? Many ideas are on the table, and opportunities for input are on the way. Once money is raised for our conceptual plan, veteran Eau Claire design firm Ayres Associates will get to work on the design and amenities. This process will include public input sessions. The EHNA Steering Committee will act as a liaison between neighbors and the designers. Good question. Our hope is to raise money for the conceptual plan and have it completed by the end of 2019. The plan itself will dictate the timeline for the rest of the project. Our initial goal is to raise $10,000 and use a large portion of that for our conceptual plan. Remaining funds will be held and applied for the construction phase of the project. The conceptual plan will estimate the final cost of construction. 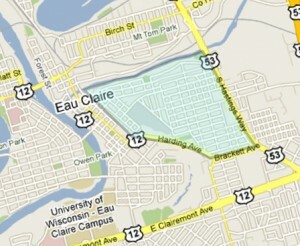 The Boyd Park Plus initiative is not funded by the City of Eau Claire and will not rely on taxpayer dollars. Funding will be provided by private donations from neighbors and area business, as well as local, state, and possibly federal grants. The EHNA Steering Committee is a registered 501(c)(3) and donations to Boyd Park Plus will be tax-deductible. What are the major goals? 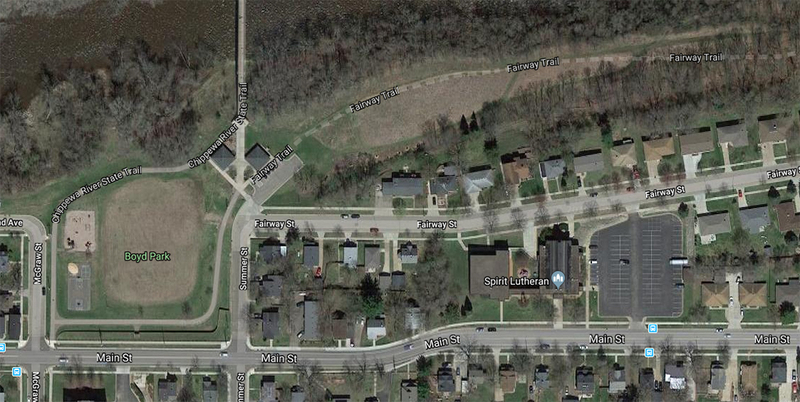 Xcel Energy will do a day of community service on April 26, clearing out dead wood and invasive species from the Eau Claire Riverbank, west of the walkbridge, allowing us to plan the park’s river access improvements.